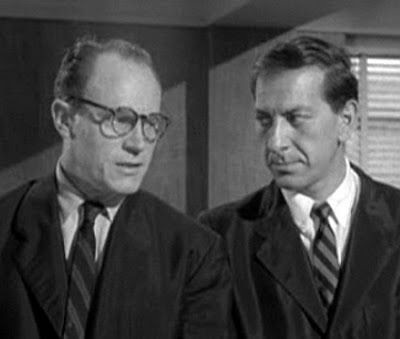 “Mail Order Prophet”, the second episode of Alfred Hitchcock Presents, Season 3, was more conceptual than some of the other thrillers in the series, and so the narrative is largely devoted to working through the idea. The production is not as smooth as other episodes in this series, with numerous awkward jump cuts marring the visual flow. But the acting is good and helps compensate. The show stars veteran character actors Jack Klugman and E. G. Marshall (who was later famous with the 1960s TV courtroom drama The Defenders), and they embody contrasting ways at viewing the world. 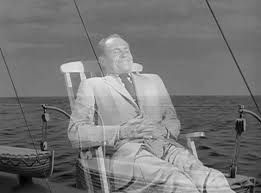 The story begins with two menial clerks, Ronald Grimes (E. G. Marshall) and George Benedict (Jack Klugman) shown working for an investment in a big desks-in-a-row office. Grimes and Benedict have desks next to each other, so they use the proximity to complain about their dreary, future-less lives. They are looking for a way out. One day Grimes gets a personal letter from a mysterious Mr. Christiani, who makes him a strange offer. Christiani’s letter says he has gained a mysterious occult power to predict the future, but the higher forces prevent him from profiting from this capability, such as placing wagers on the predicted outcomes. However, there is nothing to prevent him giving away correct predictions to others and subsequently receiving voluntary contributions (i.e. payments) from his grateful recipients. So Christiani has given Grimes a predicted outcome of an upcoming boxing match, asked that this information be kept confidential, and suggested that he might receive in turn a voluntary payment in gratitude. Christiani’s prediction turns out to be correct, and when Grimes receives follow-up letters from Christiani, he winds up discussing the matter with his friend Benedict. Right away we see the contrasting perspectives of Grimes and Benedict. While Grimes is a gullible dreamer who wants to believe in miracles, Benedict is a hard-boiled skeptic, who assures Grimes that predicting the future with precision is scientifically impossible. Much of the remaining narrative consists of an ongoing dialogue between these two men. Grimes starts making wagers on Christiani’s predictions and, in turn, rewarding his mysterious benefactor by sending him payments. So far, all five of Christiani’s predictions have been correct. Benedict assures him that it has all been a matter of luck. With the sixth prediction, which concerns a stock-market future. Grimes, now completely hooked, decides to go whole hog and he embezzles from his own company what would amount today to more than $ 100,000 to make his investment. He is now putting his whole life on the line. In the event on the stock-market trading day, Grimes hopes to see his stock shoot up in value, maybe clearing the equivalent of $ 1 million in today’s dollars. This would save his neck and enable him to escape the drudgery of his current existence. Benedict still can’t believe it, though, and when later looking for Christiani, he eventually discovers from the police that the man is a known scam artist. In fact it is the operational mechanics of this scam that makes this particular episode interesting. This is how Christiani operates. He starts by sending confidential letters to, say, 4,000 recipients (a US postage stamp cost only $ 0.03 in 1957). To half of them he predicts one side of a future two-sided outcome, and to the other half he predicts the other side. After the event, he sends letters to the 2,000 winners – to 1,000 of them predicting one side of another upcoming binary contest will win and to the other 1,000 predicting the opposite outcome. After two rounds, he has 1,000 people who have seen him make two correct predictions. Continuing in this way, after five such rounds, there would still be a guarantee of 125 people who would have received all correct predictions and believe that Christiani is a seer. Grimes just happened to be in this privileged group. I am not sure what would be illegal about such a scam, since Christiani is not coercing his recipients to pay him. But by the time we get to the sixth round, Christiani would probably receive tens of thousand dollars from his grateful few hundred recipients who believe in his occult powers. This is the kind of thing that could be exploited by religious cult leaders. By doing so they can potentially develop a fanatic following of believers in the magical powers of their leader, who then reap big financial rewards from those who believe in their occult powers. But if you really want to believe in magic, just think how incredible it is that you are a living, conscious being in this world. To express your gratitude for this miracle, bestow your love on all the other beings that you encounter.